Washington, D.C. – The nation’s leading conservative shareholder activist organization calls on Amazon and Apple to recommit to protecting human rights after both companies recently, and hypocritically, bowed to Chinese government pressure regarding Internet censorship. 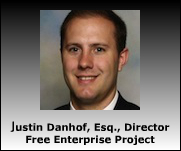 The Free Enterprise Project (FEP) notes that both companies routinely attack federal- and state-level government actions in the United States under the supposed banner of human rights, but have quickly abandoned those principles to do Beijing’s bidding. Apple recently removed upwards of 60 virtual private network (VPN) services from its app store in China. VPNs allow users to skirt China’s “great firewall” that blocks its citizens from accessing many Internet sites, including Facebook and Twitter. On Tuesday, the company that operates Amazon’s Cloud services in China told customers that they must remove any software that might let them similarly evade the government’s Internet restrictions or risk being shut down. “Liberal social justice CEOs such as Apple’s Tim Cook and Amazon’s Jeff Bezos like to champion human rights and stand up to local and federal governments here in the United States when it is politically expedient and the stakes are low. But when faced with pressure from a regime such as China that actively squashes the most basic of human rights — such as the right of free speech and expression — they seem all too willing to show their true colors and help keep the Chinese people in the dark,” said National Center General Counsel and FEP Director Justin Danhof, Esq. Earlier this year, Danhof presented a National Center shareholder resolution at Apple’s annual shareholder meeting that pointed out the hypocritical nature of some of the company’s charitable donations to questionable organizations. And, at the annual meeting of Amazon shareholders in May, Danhof questioned Bezos over the company’s public opposition to President Trump’s executive orders on immigration and travel. Danhof pointed out the hypocritical nature of the company’s position as it never took a public stance on similar travel restrictions enacted during former President Barack Obama’s administration. Launched in 2007, the National Center for Public Policy Research’s Free Enterprise Project is the nation’s preeminent free-market activist group — focusing on shareholder activism and the confluence of big government and big business. Since 2014, its representatives have participated in over 100 shareholder meetings to advance free-market ideals in health care, energy, taxes, subsidies, regulations, religious freedom, food policies, media bias, gun rights, workers’ rights and other important public policy issues. FEP’s Employee Conscience Protection Project strengthened protections for the political beliefs and activities of over five million workers at 13 major U.S. corporations. FEP’s questioning of Boeing’s and General Electric’s support for the Clinton Foundation helped trigger an FBI investigation into the Foundation’s activities. Executives put on the spot by FEP at ABC News (Disney), the Washington Post and CNN (Time Warner) meetings acknowledged media bias. FEP activity this year has been covered by media outlets such as the New York Times, Washington Post, USA Today, Variety, the Associated Press, Bloomberg, Drudge Report, Business Insider, National Public Radio and SiriusXM. FEP’s work was also featured in Wall Street Journal writer Kimberley Strassel’s 2016 book The Intimidation Game: How the Left is Silencing Free Speech (Hachette Book Group).